Difference between revisions of "Schneider, Tillmann (d. 1559)"
and Archives] '']] Tillmann Schneider, (Dileman Snijder), a [[Hutterian Brethren (Hutterische Brüder)|Hutterite]] martyr, was put to death on 4 January 1559, at [[Aachen (Nordrhein-Westfalen, Germany)|Aachen]], Germany, together with [[Schmidt, Mathias (d. 1559)|Matthias Schmidt]]. Braght, Thieleman J. van. 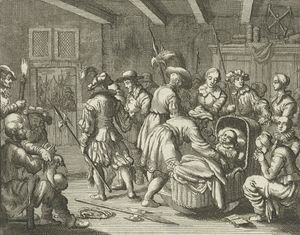 <em class="gameo_bibliography">Het Bloedigh Tooneel of Martelaers Spiegel der Doopsgesinde of Weereloose Christenen, Die om 't getuygenis van Jesus haren Salighmaker geleden hebben ende gedood zijn van Christi tijd of tot desen tijd toe. Den Tweeden Druk</em>. Amsterdam: Hieronymus Sweerts, 1685. Part II: 209. Braght, Thieleman J. van. <em class="gameo_bibliography">Het Bloedigh Tooneel of Martelaers Spiegel der Doopsgesinde of Weereloose Christenen, Die om 't getuygenis van Jesus haren Salighmaker geleden hebben ende gedood zijn van Christi tijd of tot desen tijd toe. Den Tweeden Druk</em>. Amsterdam: Hieronymus Sweerts, 1685: Part II, 209. Braght, Thieleman J. van. <em class="gameo_bibliography">The Bloody Theatre or Martyrs' Mirror of the Defenseless Christians Who Baptized Only upon Confession of Faith and Who Suffered and Died for the Testimony of Jesus Their Saviour . . . to the Year A.D. 1660</em>. Scottdale, PA: Herald Press, 1951: 588. Available online at: [http://www.homecomers.org/mirror/index.htm http://www.homecomers.org/mirror/index.htm]. Tillmann Schneider, (Dileman Snijder), a Hutterite martyr, was put to death on 4 January 1559, at Aachen, Germany, together with Matthias Schmidt. Braght, Thieleman J. van. Het Bloedigh Tooneel of Martelaers Spiegel der Doopsgesinde of Weereloose Christenen, Die om 't getuygenis van Jesus haren Salighmaker geleden hebben ende gedood zijn van Christi tijd of tot desen tijd toe. Den Tweeden Druk. Amsterdam: Hieronymus Sweerts, 1685: Part II, 209. Braght, Thieleman J. van. The Bloody Theatre or Martyrs' Mirror of the Defenseless Christians Who Baptized Only upon Confession of Faith and Who Suffered and Died for the Testimony of Jesus Their Saviour . . . to the Year A.D. 1660. Scottdale, PA: Herald Press, 1951: 588. Available online at: http://www.homecomers.org/mirror/index.htm. Wolkan, Rudolf. Geschicht-Buch der Hutterischen Brüder. Macleod, AB, and Vienna, 1923: 299. Zieglschmid, A. J. F. Die älteste Chronik der Hutterischen Brüder: Ein Sprachdenkmal aus frühneuhochdeutscher Zeit. Ithaca: Cayuga Press, 1943: 393.
, . "Schneider, Tillmann (d. 1559)." Global Anabaptist Mennonite Encyclopedia Online. 1959. Web. 25 Apr 2019. http://gameo.org/index.php?title=Schneider,_Tillmann_(d._1559)&oldid=130101. , . (1959). Schneider, Tillmann (d. 1559). Global Anabaptist Mennonite Encyclopedia Online. Retrieved 25 April 2019, from http://gameo.org/index.php?title=Schneider,_Tillmann_(d._1559)&oldid=130101. Adapted by permission of Herald Press, Harrisonburg, Virginia, from Mennonite Encyclopedia, Vol. 4, p. 470. All rights reserved.